At spoiltpig, our focus is always on the welfare of our pigs. We only work with British Farmers we know and trust and who share our values and beliefs. Now we’ve gone one step further, and are thrilled to be the first UK brand to produce award winning bacon from pigs who’ve been raised without the use of antibiotics from birth. What does raised without antibiotics mean? Well, it certainly doesn’t mean our pigs have been neglected. Far from it. All our pigs are born and thrive outside until weaned, when they move into airy, warm, spacious straw-filled barns. Our partner, Brydock Farms have set up a unique farming system that periodically moves the animals to ensure ages are not mixed, thus avoiding illness, ultimately reducing the overall need for antibiotics. Our spoiltpig bacon tastes just as good, if not better! We stand by our ethos that well cared for pigs results in the best tasting bacon. 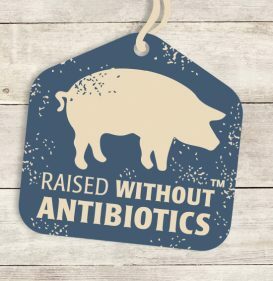 Find out more about our raised without antibiotics bacon here.